USA – For the first 122 years of its existence, the distinct looking building on 11th and Spring Garden Streets in the City of Brotherly Love was never an entertainment venue. Its new owners were quick to make up for lost time, however, when they converted the former farmers’ market turned Reading Railroad luggage handling station into Union Transfer, a red-hot music hall devoted primarily to emerging and cult-hero indie rock acts. 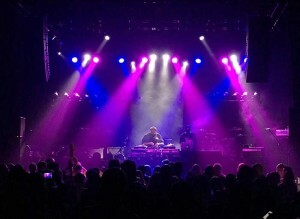 Less than two years after opening in 2011, the site was featured in Rolling Stone’s "Top 20 Venues in America" and hailed by the BBC as "one of the hottest venues on the US East Coast." A key part of Union Transfer’s appeal (aside from its knack for booking passionately followed artists like Purity Ring, Beach House, and St. Vincent) is an evocative décor that features sky-high ceilings, stunning chandeliers, stained glass throughout the building and other adornments that are seldom found in an urban industrial music club. Playing off the unique venue’s interior brilliantly, while supporting the onstage performances, is a Lenny Sasso-designed lighting rig featuring Rogue and COLORado fixtures from Chauvet Professional. Although practical considerations like maintenance and power draw were involved in the decision to go with the new fixtures, Sasso’s choice was driven more by performance features. His goal was to do more than light the stage efficiently. He also wanted a rig that would engage the audience at the 1200-capacity hall and play off its aesthetic qualities with vivid colours, crisp gobos and even light fields. Using the Rogue and COLORado fixtures in his rig, Sasso is able to cover the stage in a rich array of colours. “We get the stage’s colour on, and it creates great visual that fits with the whole image of Union Transfer,” he said. The combination of colour and pop creates a memorable light show, one that Sasso believes fits perfectly with the essence of Union Transfer, a place that set out to be special from the day it opened in 2011. Now it has a lighting rig that does some pretty special things too.